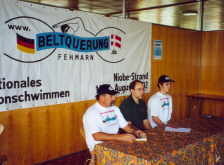 Because of short-time cancellation reasened by illness of the german swimmers this year starts only the argentine relay. So Claudio Plit competes with his son Mauro Plit. Winner is Claudio Plit. The following day starts the argentine relay in the symbolic Nationen Cup. Because of the cancellation starts only Argentina. First cancel Mauro Plit his first hour after 40 minutes and breaks with this the attempt of the relay and then the relay had to cancel his swimming because of to strong current. The attempt is out of rules. 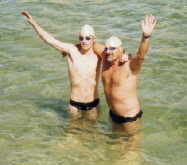 Both are transported by ship near to the finish coast to finish till the beach, where many spectators wait for them. This attempt shows the hard conditions of the Beltquerung.